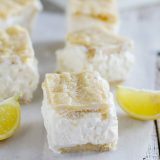 A perfect way to cool down, these Lemon Bar Ice Cream Sandwiches have chewy lemon cookies with lemon ice cream sandwiched between. In the bowl of a stand mixer, cream the butter until smooth, then beat in the sugar, baking soda, cream of tartar and salt. Once combined, beat in the egg and the vanilla, scraping the bowl as needed. Beat in the flour 1/2 cup at a time until combined. Press half of the dough evenly into the bottom of each baking dish. Bake in the preheated oven until just set, 12-13 minutes. Remove from the oven and let sit for 3 minutes, then lift the foil and set the cookie bar on a wire rack to cool completely. Soften the ice cream. Stir the lemon curd into the ice cream. Line one of the baking pans with plastic wrap and place one of the cookie bars in the bottom of the pan. Spread the ice cream evenly over the cookie. Carefully place the second cookie over the top. Cover and freeze overnight. Cut the bars evenly into 16 squares to serve.